Ahoy! The year is 2112, and the ship is ready to sail. I have been with Gaia since the formation of planet Earth and have taken countless forms and lived numerous lifetimes. In 1974, I arrived at my final human incarnation. I am now 138 years old. 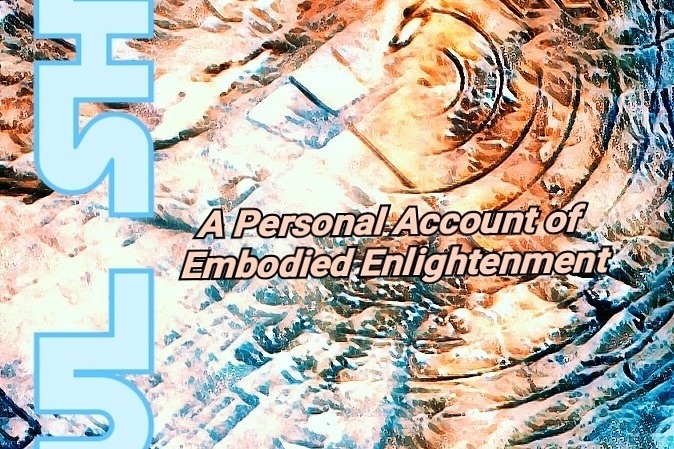 There is only one thing I have left to do, share my story of embodied enlightenment, and the pioneering of a divine knowing of consciousness within the matrix of humanity and all life everywhere, in all worlds, and all dimensions across time and space. All aboard! Publishing time is coming up next Monday! If you are donating from outside the United States an Amazon link will be available at publishing time for you to purchase the eBook or Paperback. I am no longer shipping internationally. It makes much more sense to have a 12 oz. book shipped closer to your location. Thanks you for understanding, and thank you so much for your generous donation. I highly appologize for the ridiculously expensive shipping charges for 1 book going international. I have a range of locations these books are going to, from Canada to Portugal to Germany. All ranging from the cheapest price $18-$24 + PayPal transfer fees. If you feel that you cannot afford the shipping charges, and PayPal fees for your signed paperback copy, I will send you over a PDF version. You will also have the option to purchase the paperback or eBook from Amazon in your country. Shipping will be way cheaper. Thank you everyone for you understanding. Let me know what you would like me to do. Please send me an individual message. Thank you! I just spent over a year writing this book. It was truly an amazing experience, and assisted in my integration. 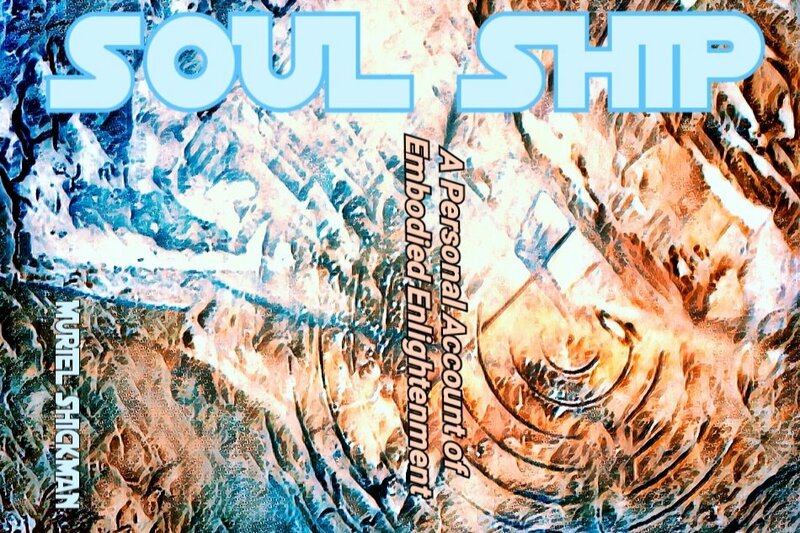 This creation is not only my short autobiography, but also the journey leading up to my self realization. I provide some insights into what is in store for humanity, and the Earth for the next several decades as well. It was a big project to write, and edit, and edit some more. Crazy amount of time spent re-reading. Over 50 hours of self publication and working with the manuscript templates. I experienced every emotion during that process. Haha! The book will be published earlier than expected thanks to my inner crew for providing extra assistance. It's over 200 pages containing beautiful artwork in color from various artists worldwide. I am working on the paperback and Ebook at the same time. The Ebook will be cheaper, but it's always nice to hold the book in your hand. I have a draft copy right now and it feels great. However, everyone has their preference. The next post will be the final release containing links to purchase through Amazon. Thanks again for your generous donation! Those of you who contributed $40 and over will be receiving a message from me. I will need your mailing address to send the paperback copy to. I'm looking forward to sharing this with you. It's been quite a ride everyone! I started writing this book a little over a year ago and now almost at the final stage before publication. I've spent the last couple of weeks editing, while making sure I get plenty of exercise. Now, for the self publication process. It takes millions of hours to fit the manuscript into a template, ha kidding! Seriously, it feels that way. It's currently under my microscopic eye to check for last minute errors. I've never been so intimate with a book. Not even in college. This is such a unique and personal project, and truly is my baby. Aside from some beautiful artwork or poetry submitted by creative peeps worldwide, I created it by my self--writing, editing, book cover design, publication process, marketing/media, administration. It takes time to create posts such as this one as well. It all adds up. That is why I have put in long hours to make it available next month. There is a certain mode I get in when I produce something that I have so much excitement for. It's kind of like being in an extremely fast moving freight train. It gains speed and I go with it. The book is over 200 pages (small font) with both narrative and stories, combined with stunning colorful photography and artwork. Please donate what you can, $40+ gets you a free copy (free shipping within the USA). 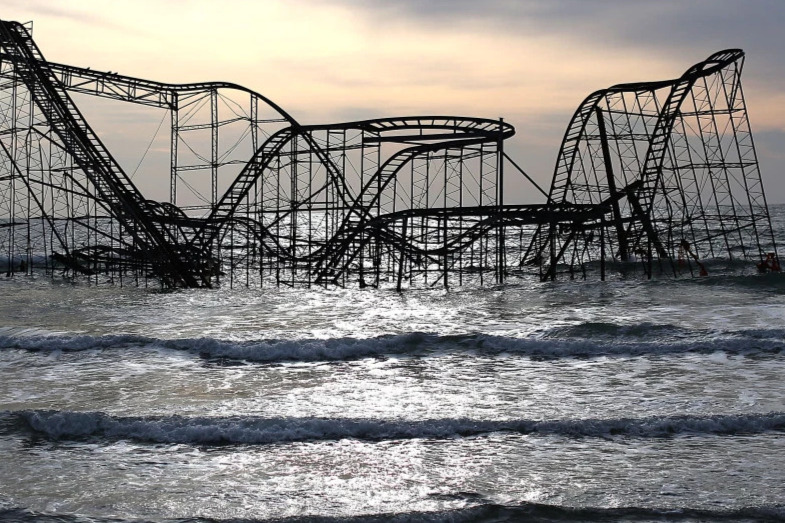 Photo credit: Roller Coaster in Seaside Heights, New Jersey after Hurricane Sandy.